In the first half of the fifteenth century in Italy shone the luminous figure of Anthony Mary Zaccaria. This young saint, full of passion for God’s love, was a great reformer of religious customs of the clergy and the Christian people. Above all, he was the founder of the Clerics Regular of St. Paul (Barnabites), the Angelic Sisters of St. Paul, and the Laity of St. Paul. 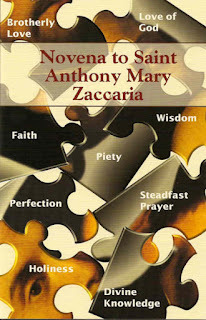 Anthony Mary Zaccaria, born in Cremona, Italy in 1502, was a student and graduate in medicine from the University of Padua; a doctor of body and soul in his native city; a fervent catechist and a zealous priest in Milan and elsewhere. 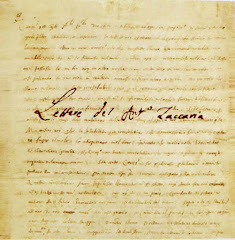 For a decade his apostolate was characterized by an intense devotion to the Most Blessed Sacrament of the altar (he was the promoter of the Forty Hours Devotion), and by a passionate love of the cross and the crucified Christ (he instituted the ringing of bells on Friday afternoon to commemorate Christ’s death). Anthony Mary was guided by an extraordinary zeal of St. Paul, chosen by him to be his master and model on earth, and his special patron in heaven. Exhausted from his pastoral work, Anthony Mary died at only 36 years old, leaving behind admirable examples of penance and of spirituality. 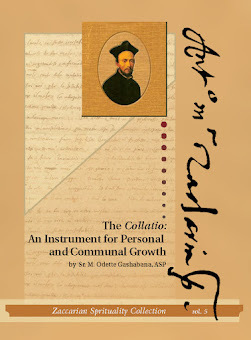 In the novena here presented, his ascetic-mystic thought continuously emerges. This thought can be found in his six Sermons and eleven Letters, which remained as his testament and a mirror of his soul and his missionary call: in these writings resounds an unceasing appeal against vices, and toward holiness. 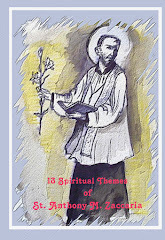 Like all the saints, Zaccaria is a figure of permanent relevance: an encounter with him symbolizes an invitation to return to a charism of a unique vocation, a return desired by the Second Vatican Council, as an indispensable element of true renewal. The Church venerates the saints and honors their images. Celebrating their names and their memory, she proclaims Christ’s marvels in his servants and proposes to the faithful examples to imitate (Sacrosantum Concilium, 11). in imitation of Christ, your Son. and keep us in the path that leads to you. and unfathomable love for all. gospel of his Son, that I remember you constantly, always asking in my prayers that somehow by God’s will I may at last find my way clear to come to you. For I long to see you, that I may share with you some spiritual gift so that you may be strengthened, that is, that you and I may be mutually encouraged by one another’s faith, yours and mine. Dearly beloved in Christ, why do you entertain any doubts? Haven’t you experienced in this undertaking that you never lacked the necessary means to help those in need? Nothing is more certain and reliable than experience. Those who love you do not possess the wealth either of a Paul or of a Magdalene; they do, however, trust in the One who enriched them both. Thus as a result of both your faith and theirs God will provide for any person under your care. You can be sure that, before you speak and in the very moment of speaking, Jesus Crucified will anticipate and accompany, not only every word of yours, but your every holy intention.Don’t you see that He Himself has opened the doors for you with His own hands? Who, then, will hinder you from entering the hearts of people and from changing them so completely as to renew them and beautify them with holy virtues? Nobody, of course − neither the devil nor any other creature. St. Anthony, precursor of Catholic reform…Pray for us. St. Anthony, faithful administrator of the divine mysteries…Pray for us. St. Anthony, priest solicitous in making gain in others…Pray for us. Christ, our Savior, you endowed St. Anthony Mary with the light and flame of a solid faith.Increase our faith, so that we may learn to love the living true God. We ask this through Christ our Lord. Amen. Donation of $ 1.00 is greatly appreciated to cover the mailing expenses.